History: Prince’s name fits him – he’s a laid back boy and a real prince of a fellow. He preferred being with people to racing. 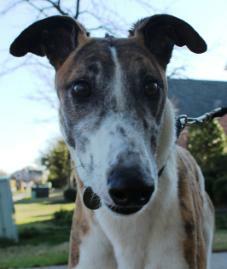 He has already had some house experience, so now he is looking for a permanent home, preferably with lots of soft beds. Prince with his new lifetime family, the Terrell family. 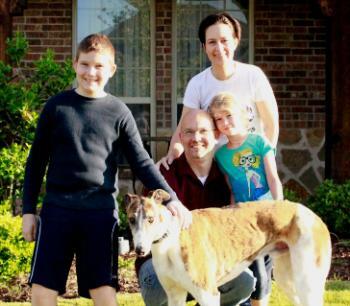 April 6, 2012 update: Prince, now Crash, adopted to his lifetime home. 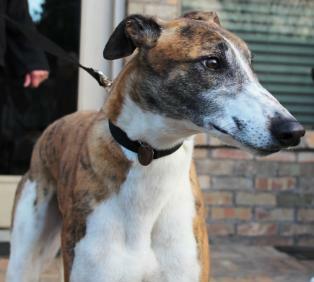 March 5, 2012 update: Prince is a very handsome brindle and white boy. He keeps up with our busy lifestyle and knows to get affection when he can. 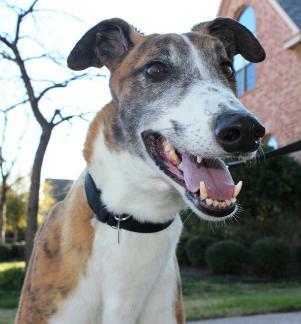 Prince is a very laid back, go-with-the-flow grey. He’s been an absolute joy to have around. When he arrived at our house, he thoroughly inspected the furry white things (our cats, Nermal and Turtle and our Italian Greyhound, Ziggy). After a few minutes, he made himself right at home on a dog bed like a pro. We work all day, so Prince spends about 8 hours in a crate during the day. He’s always happy to see us when we get home. He enjoys outings and is very enjoyable to walk with. 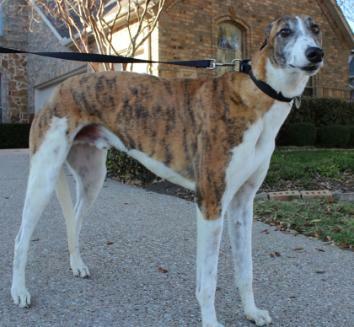 When he does see a cat or a rabbit on a walk, he freezes and then stalks his prey. It’s no wonder that he didn’t have any races. He doesn’t try to chase them! Prince enjoys an occasional treat or two, but has extremely good manners and does not counter surf or beg for human food. At night Prince likes to sleep on a dog bed right next to my bed. The best thing about Prince is that he loves our 10 year old daughter, Molly. He could not figure out why Molly kept leaving him to go upstairs. One evening he got so curious, he taught himself how to go up the stairs! We were amazed! Now, he waits for her at the top of the stairs to come down in the morning so he can get a good scratch. He also lies on the floor with her while she watches TV in the evening. 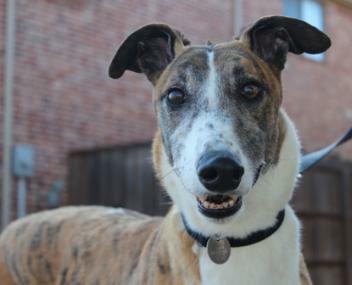 Prince would be great with children and an active family looking for a greyt companion.